In the first instance, there is agreement, that the syndrome of chest tightness, wheezing, shortness of breath, dry cough etc, which appears after a latent period of occupational exposure constitutes occupational asthma. The second category of occupational asthma is that developing without a period of latency and often associated with exposure to high concentrations of irritants. Its symptoms may be somewhat different from that of asthma that follows a latent period. This is often referred to as Reactive Airways Dysfunction Syndrome (RADS). It should be borne in mind that the airways that are afflicted by asthma are a continuation of the airways starting in the nose. It is therefore not surprising that many asthma cases also have rhinitis, (often preceding the asthma). Rhinitis literally means inflammation of the nose. Its symptoms are commonly those which the lay person associates with "hay fever" - an itchy, blocked or runny nose, often red and accompanied by sneezes. There may also be eye symptoms (itchy, glazed or runny). Thus sensitisation to certain animals (see photo) tends to manifest as rhinitis and conjunctivitis, together with asthma. Occupational asthma may also be associated with urticaria. Approximately 70,000 people in the UK according to the results of a sample questionnaire in the 1990 Labour Force Survey, believed that during a one year period they had symptoms of asthma caused, or made worse by substances breathed at work (Hodgson et al - Health and Safety Executive (HSE) Report - 1993). It is therefore an important cause of work-related ill-health, and is probably the commonest cause of new cases of occupational lung disease in general. Throughout the UK information about the newly diagnosed cases, and their causes is continuously collected through the SWORD scheme (Meredith and McDonald 1994). Workers may be unaware of the possible relationship between their symptoms and their work. Even if they do suspect a link, they may still be reluctant to present their concerns to any doctor, fearing adverse consequences for their employment.Since GPs see patients as individuals they may be at a disadvantage when compared to say, occupational physicians, in making the connection between work and symptoms.Employers often have inadequate surveillance procedures to measure the frequency of occupational asthma. Even when cases are brought to their attention, they do not always fulfil their legal obligation of reporting. Occupational physicians and chest physicians are usually well placed to diagnose cases. In the UK, di-isocyanate exposures, notably toluene di-isocyanate from exposures in occupations such as spray painting, and other work involving urethane varnishes or foams, certain waterproofing agents etc. clearly feature as the highest of the reported categories of causative agents (Meredith and MacDonald 1994). For more information about observational epidemiology of occupational asthma in the UK, please refer to SWORD (part of the THOR programme). Another important causal agent is colophony fume, from soldering especially in the electronics industry. Colophony arises from pine resin and contains abietic acid, and other resin acids which are used as fluxes in soldering. However, a very wide range of chemicals, and of agents of biological origin, have been described as causes of occupational asthma. Prevalence and incidence data for occupational rhinitis are limited but a Finnish study suggests that high molecular weight substances of biological origin - such as flour, wood dust, and animal dander - feature highest in the frequency of cases referred for investigation (Kanerva et al 1993). However, for the health care professional dealing with individual workers, or with groups of workers in a workplace, it is not the national incidence of the disease that matters. Rather, it is essential to get a grasp of the likely risk - i.e. the incidence in relation to defined jobs and tasks, and hence occupational exposures to specific agents. Can chemical structure be a useful tool in determining whether a substance may present an occupational asthma hazard? There are features of molecular structure of substances hazardous to health which appear more likely to be associated with a substance being a potential cause of occupational asthma (Agius et al 1991). An abstract of earlier work is available, and it is hoped to make more recent developments known in due course. Assessing exposure entails a scrutiny of who does what, where, and how. It requires a familiarity with the methods and circumstances of the work which, in combination with measurements, will produce a clear picture of the intensities and patterns of exposure. One of the difficulties in assessing exposures quantitatively is that the identity of the agent directly responsible for, or most closely associated with, the risk of asthma or rhinitis may be unclear, as is the case with baker's asthma. The photograph (right) was taken in a bakery, where flour dust was liberally scattered. 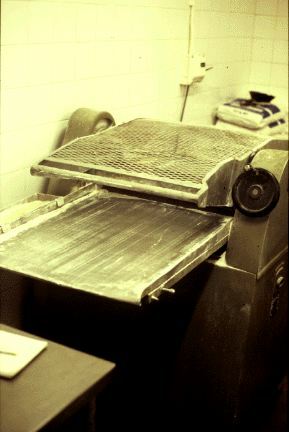 The baker suffered from occupational asthma, and it was difficult for the employer to appreciate that something as apparently innocuous as flour could cause asthma, especially in conditions of high exposure. There may be difficulties which relate to the time weighting of the monitoring: should eight-hour average exposure be the focus or should it be peak exposures? What about people who are infrequently exposed? take additional samples at relevant background locations and of lower exposure and of lower exposure tasks. The HSE's guidance, Preventing Asthma at Work (HSE 1994) may be helpful in setting up exposure assessments. the likelihood of these adverse outcomes in the light of what is known about the intensities and patterns of exposure. As regards reasonably practicable precautions,the fundamental question is: What, in a given situation, are the control measures which would reduce the risk to an acceptably low level? To answer this question one needs to determine what knowledge exists of the harmful properties of the substance and how well founded that knowledge is. A thorough familiarity with the circumstances and patterns of exposure is required, and account must be taken of any special characteristics of the exposed population. For specific exposures, there is good evidence that the risk of sensitisation is related to the exposure level. In other words - the higher the concentration of inhaled agent, the greater the likelihood of becoming sensitised and of experiencing symptoms of rhinitis and/or asthma. However it is difficult to set exposure limits below which exposures can be regarded as 'safe' in an absolute sense - although the risk might be very low. Moreover it is possible that once sensitised, the airborne concentrations at which symptoms could be provoked might be even lower than the concentrations responsible for sensitisation in the first place. Airborne exposure to respiratory sensitisers may carry a risk of asthma. Since this may be a potentially life-threatening condition, one must be confident that the risk of contracting it is very low before concluding that all reasonably practicable measures have been applied in implementing control through containment and ventilation. The most effective means of control is to prevent exposure altogether, either by not doing the task in question or by substituting the sensitiser for a less harmful material, although this is not always feasible. For example if a di-isocyanate based paint or varnish is being used, one should question whether a much less hazardous paint which simply dries out without curing can be applied instead. This might entail the need for re-painting at more frequent intervals, depending on the circumstances. 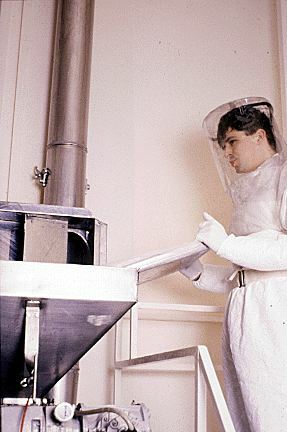 The photograph (right), depicting control measures, shows a pharmaceutical process worker tipping dust from a tray into a hopper.It illustrates a combination of control measures used when handling a substance, in the pharmaceutical industry, that may cause occupational asthma. The hopper is provided with local exhaust ventilation; the tray is covered by polythene, and the operator is wearing personal protection including an airhood, which includes a personal supply of breathing air. Similar principles of protection may be applied in a wide variety of industrial circumstances, involving exposure to man-made chemicals, or to natural products. Man-made exposures range from car spray painting with di-isocyanates, to soldering with colophony flux or the manufacture or use of acid anhydrides to make resins. Naturally occurring biological agents which may cause sensitisation range from mammalian urinary proteins, to locusts used in laboratories, to the processing of foods such as salmon, crabs, prawns or shrimps, and to rubber latex. 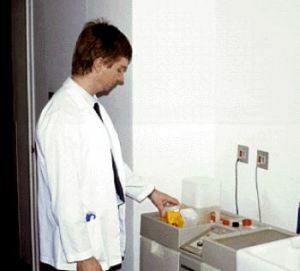 The second photograph (right), illustrating control measures, shows a radiographer in a general hospital. The processing of X-ray films may be associated with the release of various respiratory irritants, such as sulphur dioxide, glutaraldehyde, and acetic acid. Some of these may cause asthma. By using sealed bottles of photographic reagents and introducing them into the processor using a closed system, as shown in the image, exposure can be considerably reduced. Inadequately controlled glutaraldehyde exposure in the health service, notably in the cleaning of endoscopes, such as in bronchoscopy and gastroscopy, has been responsible for serious ill-health in some nurses, and other health care workers. Formaldehyde is another aldehyde implicated in the causation of occupational asthma. Other methods of control might need to be considered. For example,it might be possible to change the formulation of enzymes from fine dust into granules - which are less likely to generate aerosols - or to increase the relative humidity of environments where cyanoacrylates are handled (since water vapour will cause cyanoacrylate monomer to polymerise and become practically harmless by comparison). Personal protection, albeit the last line of defence, may play an important role in situations where control at source is clearly impracticable. Thus, for example, in paint-spraying with di-isocyanates, full-face respiratory protection is the bare minimum level of acceptable protection. In animal handling laboratories, powered filtering facepiece respirators may be a useful adjunct to other forms of control. Similarly, personal protective equipment would clearly be appropriate if a process plant was undergoing maintenance or being upgraded. For some categories of respiratory sensitisers, there is good evidence that factors such as smoking and atopy may increase the likelihood of sensitisation. Atopy is a characteristic of a large proportion of the population - perhaps even as many as 1 in 3 - depending on the exact criteria used. Atopics tend to be sensitive to common allergens such as those of house dust mites and grass pollens. Occupational sensitisation to some very important asthmagens, notably di-isocyanates, does not seem to bear any relationship at all to atopy. However, the likelihood of sensitisation to some other agents such as laboratory animal allergens or other large molecules of biological origin, is increased in atopics. Thus it is important to consider whether the extra risk associated with atopy should justify using tests or questionnaires for atopy as a discriminant to keep people out of employment. The law requires that exposure should be controlled such that almost all the population can work without an increased risk to their health. A strategy that relies on excluding about one-third of the potential workforce would implicitly be an admission that the work is not deemed safe for a large proportion of the community and would arguably fall foul of the law on that account. Published research indicates that exclusion of atopics might still allow into employment more people who would become sensitised than the number of those whose sensitisation had been averted. Evidence of atopy per se is not, therefore, adequate justification for refusing employment where there is exposure to respiratory sensitisers. (Newill et al 1986; Seaton et al 1994). Some studies have shown that smoking is a bigger and more significant prior determinant of the risk of sensitisation, whereas the risk associated with atopy is insignificant (Venables et al 1989). It enables the early identification of adverse health effects in individuals. It may supplement environmental monitoring in assessing control. Health surveillance may itself contribute to the process of hazard and risk assessment. Health surveillance should be accompanied by information regarding hazardous substances to which the employees are exposed, the respiratory symptoms which may result, the potential long-term risks and therefore, the need to report these symptoms to the occupational health service. Health surveillance records collected for statutory purposes need to be securely and confidentially stored for at least 40 years from the date of the last entry (HSC 1995). Trends of symptom prevalence, suggesting sensitisation in relation to different categories of employees, workplaces, and tasks should be investigated. prior history of wheezing or of smoking. Not all workers who develop occupational respiratory sensitisation must be relocated to a different job (HSE 1991; HSE 1994) however. Where there are appreciable doubts as to the success of an attempt to return the worker to previous employment, relocation to a different job should be pursued. An adequate assessment of the new job must be undertaken to ensure not only that it does not present exposure to the causative sensitisers, but that there are no significant exposures to other agents which may precipitate symptoms. Is the employee so unwell in terms of exercise tolerance, and physical capacity to perform work, and so likely to remain unwell that no other job for that particular employee is possible? And are all the possible jobs for that employee so unsafe, because of exposure to the offending sensitiser or to non-specific irritants, that the employee could not undertake any such jobs without significant risks to his or her health and safety? Of course, in any case, all efforts for therapeutic management of the suffering worker, are to be pursued. Employers have a statutory obligation to report clinically-diagnosed cases of occupational asthma when the cases fulfil any of the definitions in the Reporting of Injuries, Diseases and Dangerous Occurrences Regulations 1985. These include asthma caused by work with isocyanates, solder fume or rearing. Occupational asthma is also a prescribed industrial disease and the terms of the prescription have been widened to include all causative agents, provided the level of proof is adequate. The number of recognised occupational respiratory sensitisers is likely to increase. Many are probably already in existence but have not yet been recognised. Others have yet to be discovered or manufactured. Many novel chemical entities, designed for a wide range of purposes - such as high-performance adhesives and resin monomers - have chemical properties which render them especially capable of sensitisation. Our capability to predict hazards should improve, and better control methods should become available. In those instances where prevention or early detection fail, affected workers must hope that the paths to rehabilitation and to compensation will become smoother. 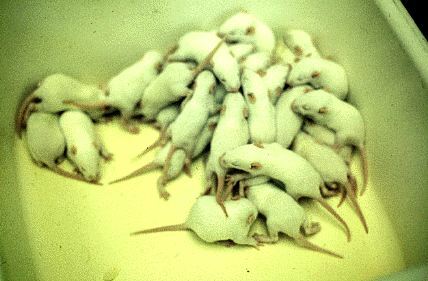 A laboratory animal house technician. Bernstein IL, Chan-Yeung M, Malo J-L, Bernstein DI (1993).Asthma in the Workplace. Marcel Dekker, New York, pp1-4. Health and Safety Commission (1995) Control of Substances Hazardous to Health Regulations 1995: Approved Codes of Practice: General COSHH ACP (Control of substances hazardous to health); Carcinogens ACP (Control of carcinogenic substances); and Biological agents ACP (Control of biological agents). One-volume set of three ACPs (ref L5) ISBN 0 7176 0851 4. Available from HSE Books and from approved outlets, price 6.75. Health and Safety Executive (1990). (HS(G)61) Surveillance of people exposed to health risks at work. HSE Books. ISBN 0 11 885574 3. Health and Safety Executive (1991) (MS25) Medical aspects of occupational asthma. HSE Books. ISBN 0 11 885584 0. Health and Safety Executive (1994) Preventing asthma at work. How to control respiratory sensitisers. HSE Books. ISBN 0 7176 0661 9. Hodgson J T, Jones J R, Elliott R C and Osman J (1993) Self- reported work-related illness. Health and Safety Executive Research Paper 33. HSE Books, Sudbury. Kanerva L, Vaheri E (1993) Occupational allergic rhinitis in Finland. Int.Arch.Occup.Environ.Health,64,565-568. Meredith SK and McDonald JC (1994) Work-related respiratory disease in the United Kingdom, 1989-1992: report on the SWORD project. Occup Med, 44, 183-189. Newill C A, Evans R and Khoury M J (1986) Pre-employment screening for allergy to laboratory animals: epidemiologic evaluation of its potential usefulness. J.Occup.Med.28,1158- 1164. Seaton A, Agius R, McCloy E and D'Auria D (1994) Practical Occupational Medicine , Arnold publishers.London.pp.78-79,99, 133-134. Venables K, Dally M, Nunn A, Stevens J, Stephens R, Farrer N, Hunter J, Stewart M, Hughes E and Taylor A N (1989) Smoking and occupational allergy in workers in a platinum refinery. BMJ,299,939-942. Part 1: Definitions and incidence. By Gillian Fletcher and Raymond Agius. OHR 53 pp 14-16. Part 2: A basis for primary prevention. By Alf Chamings and Raymond Agius. OHR 54 pp 32-35. Part 3: Health surveillance and secondary prevention. By Raymond Agius. OHR 55 pp 28-31. Part 4: Case management and tertiary prevention. By Raymond Agius. OHR 57 pp 27-29. The above four articles and this abbreviated version are subject to copyright. While this account has been written and published in good faith, no legal responsibility is accepted for its contents or their interpretation. Workers who suspect that they might have occupational asthma or rhinitis should consult their general practitioner (and occupational physician if their workplace employs one). Research by the author and colleagues on occupational asthma hazard prediction based on quantitative structure activity relationships: Experimental hazard prediction.